L-R: Ugo Chukwu, Megan Hill, Justin Long. Photo by Carol Rosegg. From March 13 toApril 27, 2019. Tues. – Thurs. at 7 PM; Fri. – Sat. at 8 PM; Sat. – Sun. 3 PM. At the Vineyard Theatre, 108 E. 15 St., NYC. Tickets: $45 – 100. Online at vineyardtheatre.org, by phone at 212-353-0303, or in person at the box office. "Do You Feel Anger?" 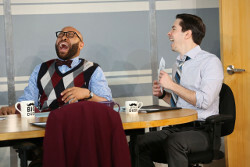 by Mara Nelson-Greenberg at the Vineyard Theatre is an inventive, incisive and – yes! – a funny funny absurdist comedy about male privilege in the corporate world. Neil LaBute began the discussion in "In the Company of Men" (1997). "Mad Men," the AMC television series, added its own spin, but Mara Nelson-Greenberg is the first playwright to bring a feminist eye. Her vantage point is inspired: Sofia (Tiffany Villarin), a gracious liberated woman. Sofia has been hired to raise the empathy quotient at a particularly callous debt collection agency. Among her success stories is a a broker without tear ducts she taught to cry. Unbeknownst to her, the agency is her first major challenge, and in taking this on, we come to realize, she has taken on the whole chauvinistic world. L-R: Ugo Chukwu, Justin LongPhoto by Carol Rosegg. Eva (Megan Hill) is the first employee to arrive at the session. She seems bizarre, unhinged, and excessively cheerful. With a crazy laugh, she confuses her father with her boyfriend. Is her claim to be continually mugged in the break room delusional? She advises Sophia that only having a boyfriend can protect her from male harassment. 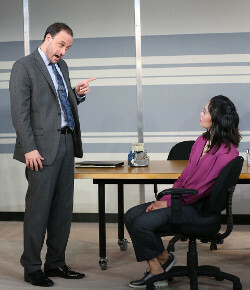 When Jon (Greg Keller), the office supervisor, appears he is dismayed that Sophia is not wearing a dress and orders her to end the training that day. When she informs him that she will be onsite for weeks, he is less than happy. Obviously the empathy training was not his call. His polite hostility is more than matched by the two male employees' babbling defensiveness (Justin Long and Ugo Chukwu). But Sophia keeps her cool, even when she receives an inappropriate email from her dad. L-R: Tiffany Villarin, Megan Hill. Photo by Carol Rosegg. We watch her struggle. The men are impossible. They know their job but they can't recognize emotion in others -- not from facial recognition, voice or even narrative. They make up words and support each other – even against reason. They tell her they are "horn" (for "horny") at any opportunity. Sometimes they lose it and collapse into infantile behavior. Since Jon supports them, they feel empowered. Eventually Sophia goes from a suit to a dress and heels. She invents a boyfriend. She laughs at the men's vulgar jokes about women. She meets the men half way and she almost loses. It is funny. But Eva gains strength through Sophia's support. She shows up in slacks (Emilio Sosa, costumes). When Sophia, having bent so far backwards she almost disappears, makes a break-through, she is immediately bullied by the supervisor into ending the sessions. In the last scene -- in the women's bathroom -- absurdity wins -- as the women's psychic wounds take on physical manifestations. L-R: Greg Keller, Tiffany Villarin. Photo by Carol Rosegg. complaint with Human Resources? Or the police? As for Sophia's ignoring her mother's phone calls for a month – well, she has problems too. There are many ways to direct the action. Margot Bordelon chose caricature. I think the comedy is strong enough to play it straight. "Do You Feel Anger?" received its world premiere at the 2018 Humana Festival of New American Plays at Actors Theatre of Louisville. It's a very good play, which is rare. It has been extended until April 27. Go see it.